On arrival at our hotel in Klein Windhoek, luxurious, spacious and surrounded by olive trees, I am shown a bucket in the shower. This becomes a theme. Water – scarce, absent, or cascading with uncontrolled force – is a presence through much of our journey in northern Namibia. Here, nature is formed and ruled by elemental forces, especially fire and water; I am fascinated by how it molds and adapts accordingly. As we leave Windhoek, spring is a riot. The jacarandas (J. mimosifolia) are clouds of mauve blossom, the flame trees (Delonix regia) glow orange-to-red against the blue October sky. Our route north passes rocky outcrops and hills, scrub and camel thorn trees (Acacia erioloba) festooned with weaver birds’ nests. Termite mounds dot the landscape, some reaching dizzying heights. In dry riverbeds there is evidence of recent rain, and bids to control sudden oversupplies of water through engineering works. We approach Erindi Private Game Reserve along a lengthy track, the first of several such juddering surfaces that our intrepid party of five must tackle on this tour. Then we seem to step into another dimension: Boulders strewn among trees and scrub, tall grasses bleached golden by the sun stretching into the distance, a luminous sky. A female giraffe bestows a lofty, silent greeting, a male elephant strides ahead, helmeted guinea fowl fuss and scatter in all directions. Old Trader’s Lodge is well positioned and busy. The young South African guides are uniformed, smart, smiling but I sense not quite in touch with the wilderness they must introduce us to. Game drives are optional; the Lodge is beside a water hole, and at dawn and sunset there is a chance of seeing a great variety of wildlife right here. Otherwise, it’s the luck of the draw: At 73,000 hectares, the reserve is vast, the hiding places endless. The morning drive introduces us to a magical landscape in the fresh light of dawn. 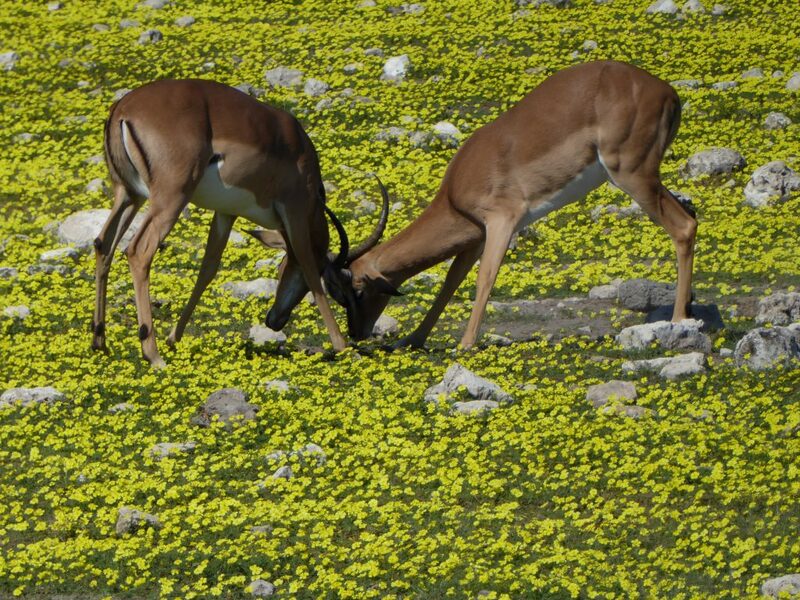 We discover ostrich and wildebeest, springbok, impala and kudu. We smell a male elephant in musth before we see him, and quietly wait for him to pass by. A small herd of Hartmann’s mountain zebra takes flight, stops and turns to watch us: the observers observed. Birds are abundant, from African spoonbills and heron at a water hole to goshawks and a lappet-faced vulture atop the acacia trees. A sociable weavers’ nest is a communal – and sizeable – development of the singletons’ seen earlier. Learning to read the markers, we see where elephants have passed, stripping bark from trees to feast on the delicate growth beneath. Or where hippos lumbered along in the night, their droppings marking the route. In the evening, our guide is back and forth on the radio to colleagues on the lookout for lions. A shepherd’s tree (Boscia albitrunca) is scored by claw marks, a delineation of territory. Eventually we find a male and two females resting, two young males some meters further on. They could not be less concerned about our presence. We leave Erindi early, disturbing a family group of oryx with a number of young, their horns still short. Elegant and silent, they move away. We will encounter many more oryx in the coming days, often in harsh conditions to which they are well adapted. Our route takes us across a wide plain, with umbrella thorn (Acacia tortilis); beyond Omaruru we find black thorn, A.mellifera. The absence of rubbish and human detritus is remarkable. Livestock are grazing by the roadside, and occasionally we see a herdsman, yet man treads lightly upon this land. We reach Palmwag across a spectacular landscape of plains, rugged hills and inselbergs, followed by towering cliffs of red sandstone with drifting sand. The Desert Rhino Camp is some distance within the Concession and it’s a bone-rattling drive to reach it before sunset over ground strewn with red volcanic basalt rocks and across uplands of breathtaking beauty. There’s a first glimpse of the extraordinary Welwitschia mirabilis, one of Namibia’s national symbols. Low on the ground, resembling a heap of drying leaves and reddish flowers, each slow-growing plant has only two leaves and may be hundreds of years old. On arrival we are warmly greeted in song by the staff, followed by a sundowner around the boma fire, and dinner under the stars. Our accommodation, part-chalet and part-tent, is ideal: simple, comfortable, surrounded by nature. With an expert guide, Johannes, assisted by trackers employed by the Save the Rhino Trust (SRT), we set out to track some of Africa’s rarest wild animals: free-roaming and desert-adapted black rhinoceros. After a while an adolescent male breaks cover from the dense shrubs where he is browsing, followed by the mother rhinoceros. I fear the trackers may have disturbed them for our benefit. Both have been de-horned for their protection from poachers, but the horns will re-grow. Later, as we picnic on delicious food under a spreading mopane tree, the trackers explain how they monitor the rhino population and collect data for the SRT. 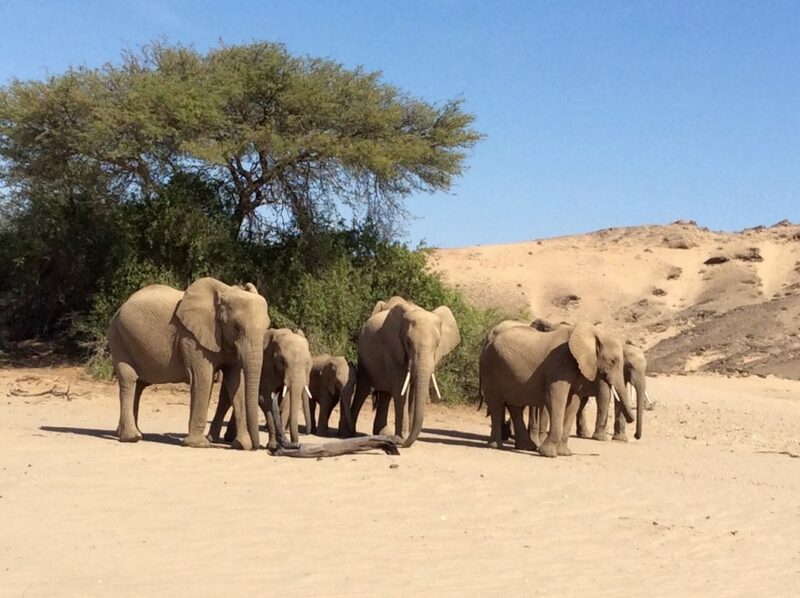 Carried away by the spirit of adventure, we continue along a dry riverbed to find a family of desert-adapted elephants. We watch, spellbound, as they interact and browse, deftly shaking the dust off grasses before consuming them. Lastly, at sunset, we observe spotted hyena cubs playing by their den, a world away from the vicious-jawed scavengers of reputation. A magical day ends with a gathering around the barbecue out in the bush, with music and song, and a starlit return to camp. Setting off early for Doro !Nawas, we embark in a 12-seater Caravan plane for the flight to Hoanib Skeleton Coast Camp. It’s the only way to reach our destination, and it’s a revelation. Driving across Damaraland is one thing but it’s a completely different experience to see from above the spectacular formations of volcanic and sedimentary rock and great sheets of lava created before the Gondwana continent broke up and the land that became South America drifted away. Little water is visible in the dry riverbeds, yet the vegetation ranges from sparse to dense. In the distance, there is a sandstorm. Hoanib Camp nestles among the rugged hills, a natural fit. Beautifully designed, running entirely on solar power, it also provides support to a project monitoring the region’s desert lions. During an evening drive along the dry Hoanib riverbed (from the Damaran “place where elephants roam”) we discover magnificent ana trees (Faidherbia albida) and toothbrush bushes (Salvadora persica). Flotsam is all around, and past floodwaters have washed away great chunks of the riverbank, leaving full-grown trees suspended from the remaining bank above! In a day-long expedition, we follow the river, which flows underground along the entire route, to its flood plain deep inside the Skeleton Coast National Park and then on to coastal sand dunes. It’s a tough environment in which giraffe, ostrich, springbok and oryx thrive. Elephant dung is plentiful yet we do not find the herd; our excellent guide, Michael, identifies the tracks of two young male lions – then we lose them among the dense brush of the flood plain. Once, a zebra cobra rears its head beside the track, displaying an impressive hood, and slips away into rocks nearby. There are kestrels, buzzards and black-chested snake eagles. The flora, low on the ground, is adapted to the conditions, with grasses and !nara melon (Acanthosicyos horridus) hugging the sand on the dunes and surviving by absorbing the condensation from coastal fog. Insects, and even mice, are plentiful in this extraordinary terrain. Expertly handling the heavy-duty Toyota 4×4 Michael takes us up onto the crest of a dune. The view is stunning, the wind keen; we can smell the ocean. At Mowe Bay there are thousands of protected Cape fur seals. Resting in their breeding ground, the colony consists of dominant males with their harems, and pups. The young are vulnerable, and black-backed jackals and vultures wait patiently to pick off the weaker ones. For us, however, lunch is a wonderful surprise: A banquet set out on the beach, with every detail of our alfresco feast meticulously planned. It is followed by a flight back to camp, with incredible views over the ocean and numerous dry riverbeds and oases. In the dry river valley we watch a troop of giraffe browsing acacia and salvadora and discover a herd of elephants with females and young, but no bull. Michael identifies them by name and outlines each one’s character and idiosyncrasies, from “Duchess” the matriarch of the group to younger females. We sit quietly, watching and learning…. Our last view of Hoanib Camp is of juvenile springbok exuberantly leaping into the air – “pronking” – full of the joys. We travel to Mowani Camp, where the accommodation is set among massive granite boulders. Grasses and aloes have been planted to soften the arid rock. A high viewing terrace has superb views south towards Mount Brandberg, Namibia’s tallest mountain in an area rich with minerals. There’s a romance about Mowani: Mopane groves near the lodge are strangely evocative of Mediterranean olive groves, although the trees are not similar. Wide plains scattered with grasses are crossed by ostrich and springbok, and roamed freely by elephant. Wild flowers are in bloom, and unearthly, white-barked star chestnuts, Sterculia quinqueloba, cling to steep hillsides. The geology is extraordinary. In the Valley of the Organ Pipes dolerite rock was shaped into vertical polygonal columns as magma from below the earth’s crust cooled millions of years ago. Close to Twyfelfontein we find great sandstone boulders that reveal an even more compelling story, their flat surfaces covered in rock carvings of giraffe and oryx, ostrich and rhinoceros, thousands of years old and in wonderful condition. We return to Windhoek, visiting en route the Petrified Forest where fossilized trunks of pine trees are exposed. They were uprooted and washed here during a cataclysmic flood at the end of a Gondwanan ice age some 280 million years ago. In the bright sunlight we can see the wood grain and knots where branches once grew. Of such extraordinary stories is Namibia made. 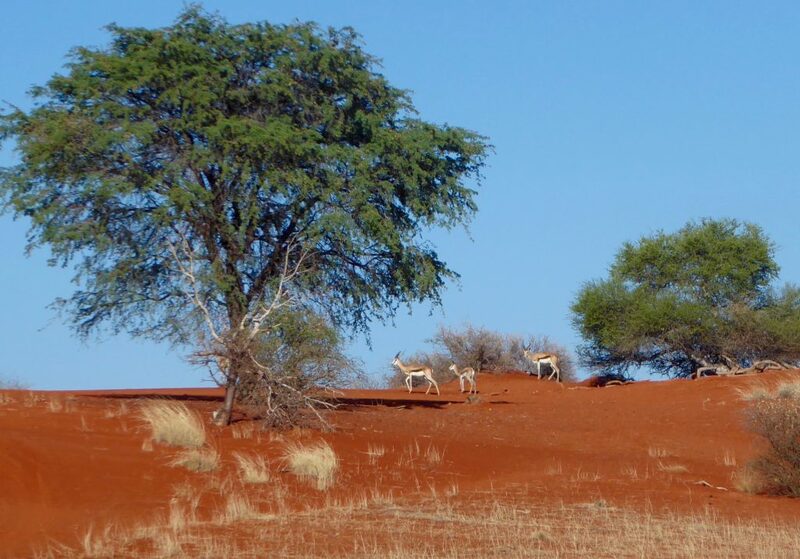 To view our Nambian Tour (Namibia – Deserts, Dunes and Canyons – Landscapes, Geology, Flora and Fauna) please click here.